Detra Mardis, human resources manager with Eaton in Sumter, South Carolina, explains how apprenticeship creates opportunities for the company, the employees and the local technical college. EDGE: What are some of the top positive outcomes of having an apprenticeship program? Detra Mardis: Our personal commitment to developing knowledge and skills helps us achieve Eaton’s business goals. Eaton promotes lifelong learning by providing many avenues through which employees are able to expand their competencies and prepare for personal and professional growth. An apprenticeship program is an additional tool to help recruit and retain talent. It also helps to build a pipeline of successors for key roles within the organization. EDGE: Tell us about the implementation of your apprenticeship program. How did Apprenticeship Carolina™ and your local tech college help you get it started? DM: Central Carolina Technical College (CCTC) brought the opportunities to Eaton and paired us with an Apprenticeship Carolina consultant. The consultant actually came to the facility, provided an orientation of the online system and provided assistance to the human resources team as apprenticeship information was uploaded. We appreciate CCTC keeping us in mind as programs and other benefits became available. EDGE: Is there a successful apprentice that you’d like to highlight? DM: Several of the new employees we have hired by way of the former South Carolina Manufacturing Certification program at CCTC have been promoted to positions beyond the entry-level manufacturing roles for which they were initially hired. Examples include Gary Chapman, who was originally hired into a production associate position but was promoted to a Lean/Continuous Improvement Technician after his first year of employment. EDGE: What are some of the financial benefits of apprenticeships? 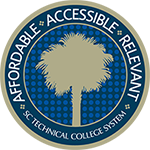 DM: In addition to the tax credits and the South Carolina Apprenticeship Initiative (SCAI) grant, we were able to reduce our recruiting expenses by partnering with CCTC. The school had an accessible pool of candidates for us to consider. 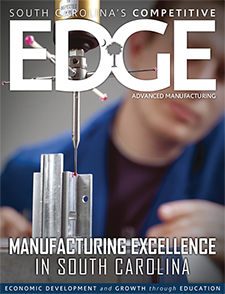 EDGE: How is your local technical college helping to meet your training needs? DM: Eaton has a long-standing partnership with CCTC. The college has helped us develop training programs for existing employees on many occasions. We’ve hired several students who’ve successfully completed the manufacturing certification program and have also sponsored internships for the mechanical drafting program. members to the team by simply thinking outside the box. EDGE: What do you like most about your apprenticeship program? • The apprenticeship program strengthens our partnership with the local technical college. • It required very little effort on our part to get started. • The apprenticeship program promotes career opportunities within the local community. • Apprenticeships offer an additional element of pride for those who successfully complete the process. EDGE: If you had the opportunity to talk to another company about apprenticeship, what would you say?